Each grade level my small people have been through has had its own positive qualities, but I think my favorite to teach is kindergarten. There are so many fun things about kindergarten. I love that most of kindergarten can be taught simply through living life. Unfortunately, I learned that lesson too late for my oldest. When he was small, I pushed him way too much, and school became a chore. I've since realized that there's plenty of time for "schoolwork" later. It's important to let them be children when they are small. Children at kindergarten age are natural learners. They want to learn about everything. They ask "why?" about EVERYTHING. This year Sassy Pants would have been in 4K if she had gone to school. Because her birthday is in October, she turned 5 right after we started school in the fall. She wanted to "do school" like the older ones so we used My Father's World Kindergarten this year. She's done well, but is nowhere close to being ready for 1st grade in the fall. So I'm thinking about doing some unit studies with her for her "official" 5K year. Any suggestions on what topics we should cover next year? Living through life is such a wonderful way to learn. The skills we learn are much deeper and we tend to remember them more, because we're doing them because we want to. I completely agree. My kids learn so much more when they're just learning through living. Lovely post. I remember my daughter at that age, every question was "why?" and "whazzat?" I also remember as a kid really wanting to follow my big brother to school, and even made my mom pack me a lunchbox so I could "pretend." :) Enjoy your A to Z! My youngest has been the easiest to teach of all of them because she wants to keep up with the older ones. Have you read about the Thomas Jefferson Education? It's my favorite approach to education. We lead an interest-based study until later grades, consisting of many, many library/event visits, and exploration focused around why the individual is most interested in. If he's huge into bugs we spent a month reading bug poetry/stories, writing bug stories, checking out bug articles and movies, singing silly bug songs, doing math with toy ants etc. It takes some effort, but it's the best way to help a kid love learning. My daughter proclaimed she hated writing--until the day I asked her to write a story about a picture she'd colored. It was 100 words, and hillarious. After we all had a good chuckle over it, she suddenly LOVED writing. Go figure. Admittedly, I'm not great with this for my younger kids, but they still lead the way with their own interests most the time. I haven't heard of that. I'll have to look into it. It sounds like a great way to teach. Hopefully she'll never lose that enthusiasm for learning. I am going to give My Fathers World a serious look. 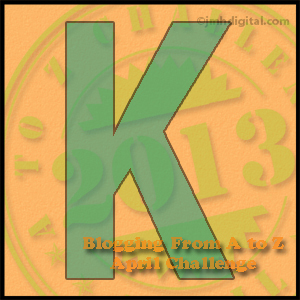 Great K post!